Three lunch trucks park on Beverly Glen during the day. The customers are mostly contruction workers, gardners , Bel Air security guards, and immigrant workers from the nearby Holmby Hills and Bel Air. It’s a convenient and cheap bite to eat in an area where most local lunch spots can be budget busters. 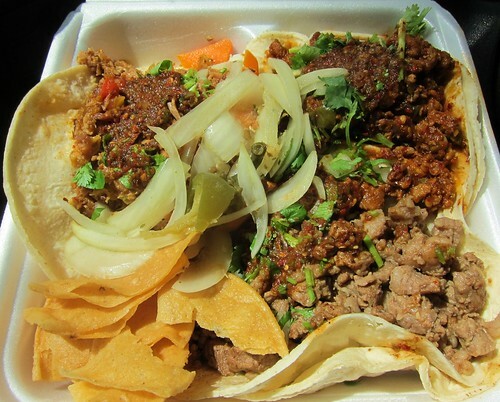 Out of the three La Favorita resembled more of the traditional taco truck with a menu of tortas, tacos, and burritos with the full roster of meat choices. 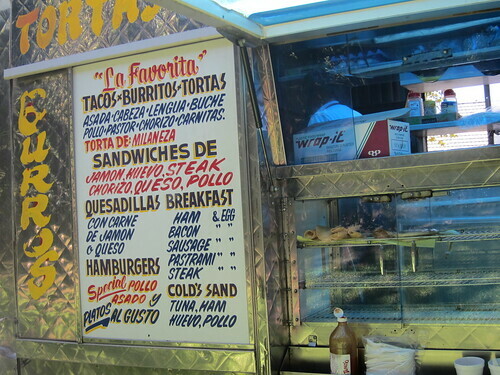 But with the sandwhich choices on the menu La Favorita is more a standard worksite lunch truck, a place where you can load up on some protein and get back to work with a full belly. 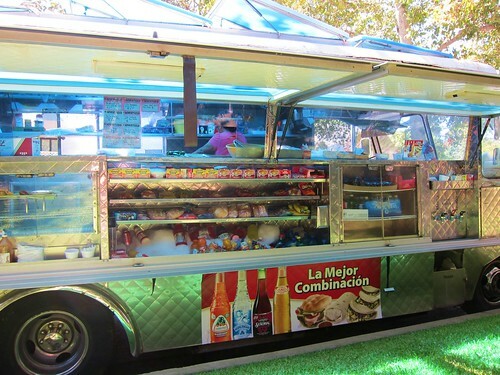 When I was a teenager I worked construction during summers and would eat at these type of lunch trucks all the time. There weren’t any rules when it came to who’s turn it was to order, you simply barked out your order and hoped the cooks in the truck heard you. Sometimes a woman would stand outside the truck with a chain dispenser on her belt and take orders and collect money. I think that was my first experience of eating off of loncheros. I ordered the asada, carnitas, and al pastor. My tacos were $1.50 each and came in a styrofoam container. When I opened the container the first thing I noticed was that these were big and there was a lot of meat. Two of these would keep you full all afternoon and give you enough energy to motor through the workday. The next thing I noticed was how dodgy the meats looked. I picked at each meat - the beef was boiled and fatty, the carnitas tasted like it was scrapped off the bottom of the pan and the al pastor was ground pork mixed with either nopales or bell pepper, I couldn’t tell. I dug in taking a couple bites of each taco. They were quite poor. I coaxed the onions and jalapeno into the carne asada to provide some flavor and got through it. Ordinarily I wouldn’t put worksite lunch trucks up to taco criticism. They serve their purpose and I guess you can say that they aren’t really in the game. But I was dead tired and didn’t feel a night time taco hunt in me tonight. I needed to find a daytime taco truck and any truck would do. Beverly Glenn 2 blocks south of Sunset. "The next thing I noticed was how dodgy the meats looked." Maybe that's what happened to Lady Gaga's meat dress!